Mirror therapy radio story, Breakfast with Spencer Howson on ABC Local Brisbane radio 612, 9 July 2015. Mirror box therapy: Technique tricks brain into restoring movement to damaged limbs, ABC News, 9 July 2015. Four-armed robot to perform with orchestra in Brisbane on Sunday, Breakfast with Spencer Howson on ABC Local Brisbane radio 612, 21 August 2015. Mentor Blaze to set Queensland alight, Tech Street Journal, 9 September 2015. State GovHack awards to showcase Queensland’s best, Tech Street Journal, 31 July 2015. Toowoomba to launch inaugural GovHack, Tech Street Journal, 24 June 2015. Photographs published in The West End Magazine in their winter print edition magazine. Photographs published in The West End Magazine in their ‘Weekly Update Newsletter’, 10 April 2014, 16 April 2014. Photograph published on page 11, UQ Planning Research Journal, November 25 2013. Thieves try to blow up Gold Coast ATM, manage to destroy it and leave empty-handed, The Courier-Mail, November 15 2013. Girl, 13, bitten by red-belly black snake on school excursion in Gold Coast hinterland, The Courier-Mail, November 15 2013. 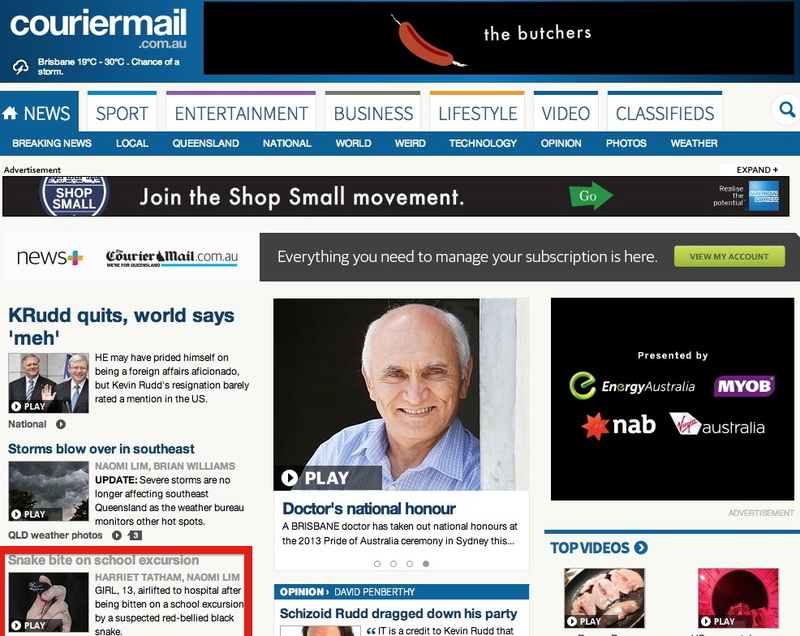 Displayed in red as key story on Courier Mail online. Mesothelioma is a preventable disease: Heathers’ story, WrappingUp.com Blog, October 25 2013. The following published articles are related to my internship at Human Ventures, a leading creative and social enterprise that utilizes creativity to help disadvantaged communities do better. Read about the program here. Cross Party Support for Indigenous Recognition, lowercase, September 2 2013. The Grand Plan, lowercase, August 27 2013. How to Vote, lowercase, August 19 2013. The Royal Wedding, Lattitude Global Volunteering, June 2011.